The Keth are the oldest race in the universe. Some artifacts discovered on their worlds have dated back to the dawn of the Universe itself. 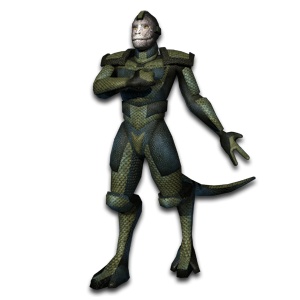 The Keth themselves are a race of bipedal reptilians that possess a humanoid figure, but the similarities end there. Firstly, the Keth have a hard outer carapace, composed of large scales that cover their entire bodies. They do not have any hair to speak of, but they do often carve and shave their natural bone tusks on their heads to signify social standing. The Keth are proud warriors that abide by codes etched in stone tablets that are older than most stars in the universe. These tablets are made of a mineral not found on any planet currently in existence and are seemingly indestructible. Even so, the Keth guard these “Tablets of Honor,” as it is roughly translated. The author of these tablets, in Keth culture, is said to be the first Keth, birthed from the womb of a star and given the task of spreading life to distant worlds. It is said that this original Keth created a female from nothing but dust before writing the tablets himself. They are kept under constant surveillance and are often referred to when making decisions regarding government or war efforts. The Keth are equally noble when they are not participating in training or full-on battles. The structure of their government is similar to a republic, with all citizens having a vote and an input on government legislature. All Keth, once they reach a certain age, are required to undergo rigorous battle training, resulting in an entire race of battle-hardened warriors. The Keth are a conquering race and have amassed much technology and resources over the millions of years they have roamed the cosmos. The first contact with humanity was rough, while the relations with Synthetics have been primarily amiable throughout the years. As it stands, the Keth and the Federation are still in a state of war, though two races with similar values of imperialism were bound to one day come to odds with one another.